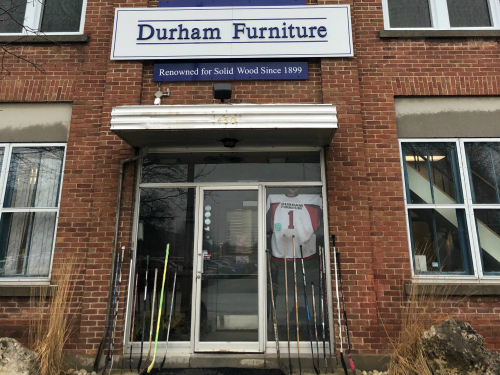 DURHAM, Ontario – Employees of solid wood bedroom and occasional case goods producer Durham Furniture placed hockey sticks outside the front entrance to the company’s head office here as a show of support for the survivors and communities impacted by the recent accident in traffic accident in Saskatchewan that claimed the lives of 16 players and team officials of the Humboldt Broncos. The team – part of the Saskatchewan Junior Hockey League – was on its way to a play-off game on Sunday, 08 April when it was part of collision. At press time, about ten team members remained hospitalised as those who died were buried in funerals held across Alberta and Saskatchewan. Durham Furniture also lowered its flag to half-staff to honour the crash victims.